Registration is now open for the 2019 Teal Steps Walk being held at 9 am on Saturday, September 28th in Tidelands Park in Coronado. Click on this text to register. Ovarian Cancer is the fifth leading cause of cancer-related deaths among women in the United States. As currently there is no screening test for the early detection of ovarian cancer, Ovarian Cancer Alliance of San Diego is working towards advancing cancer research and education of the medical community for early diagnosis; improving the quality of care for patients; and expanding their community outreach program to include all gynecologic cancer awareness to civic groups, organizations and the general public throughout the San Diego County. In Her Own Words…Sue S.
I will forever be grateful to the turkey who gave his life to save mine. November 2006 I couldn’t eat any of the beautiful Thanksgiving meal I had prepared. This made me admit I wasn’t feeling well and made an appointment to see my doctor. That started me on a 12-year journey of prolonged ovarian cancer, stage 2C. I have faced three recurrences along with 65 rounds of chemotherapy and 16 rounds of radiation during this time frame. Explore our website to learn about our dedicated volunteers and members, our multi-faceted advocacy efforts and relevant advances and resources for information about ovarian cancer, and opportunities to participate. OCA of San Diego was founded by Peg Ford, ovarian cancer survivor, and Kathy Hagan who lost her mother to ovarian cancer. 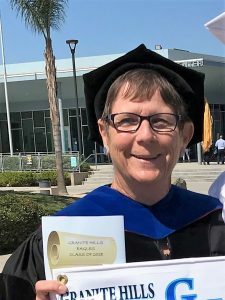 Peg implemented the Ovarian Cancer National Alliance’s Survivors Teaching Students® Program (click here) at UCSD School of Medicine for Third Year Medical Students in December 2008 and further expanded the program to currently eleven schools of nursing throughout San Diego County. 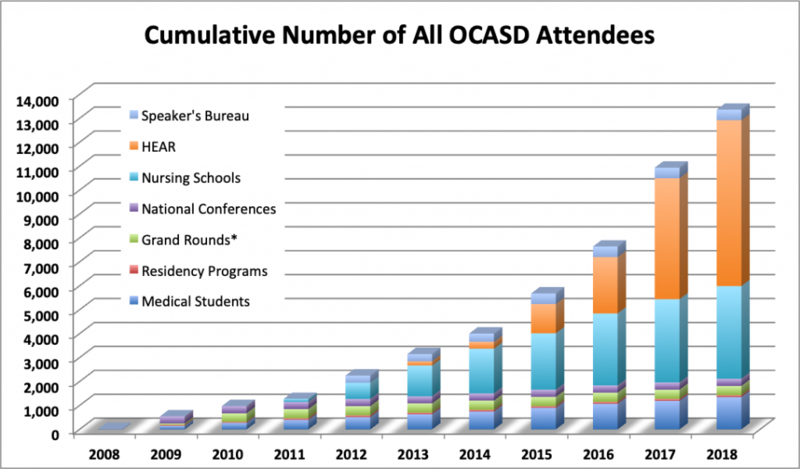 For any questions about our organization, please email President@ocaofsd.org. Thank you. Helped us understand how insidious/rapid the onset can be. It was helpful hearing the patient’s perspective of hearing about the diagnosis. It has put real faces to the disease and added gravity to my perspective. Certainly, put it in my mind to consider when seeing a patient with concerning symptoms. Yes, hearing the story gives you a pattern to recognize if a patient with a similar story comes your way. Yes, this was much better than having a lecture, the experience with story in my head is much longer. It has made me more aware and likely to listen to women patients when they feel something isn’t right. This was a fabulous presentation! Thank you. I will put ovarian cancer on my DDX for urinary concerns along with abdominal bloating. Know the Symptoms and Take Action! Ovarian cancer is the deadliest of the gynecological cancers. Pap smears detect cervical cancer not ovarian cancer. When detected early and treated properly, more than 90% of women survive longer than 5 years. See your doctor, preferably a gynecologist, if you have these symptoms almost daily for more than a few weeks and they are unusual for you. Experts suggest a combination of pelvic exam, CA-125 blood test and trans-vaginal ultrasound. Prompt medical evaluation may lead to detection at the earliest possible stage of the disease. Early stage diagnosis is associated with an improved prognosis.